Death Star troopers onboard the second Death Star. Death Star troopers, also referred to as Imperial trooper guards and Death Star sentries, were elite Imperial Navy troopers chosen by Grand Moff Wilhuff Tarkin for placement on the first Death Star. As the Death Star came closer to completion, Grand Moff Tarkin sought the need to create a specially trained fighting force which were taken from the best of the Imperial Navy troopers. Once their training was complete, the new Death Star troopers became multi-talented individuals who fulfilled a wide variety of roles which included both combat and non-combat positions throughout the battlestations. This included training that taught them skills in advanced combat as well as independent command training. Ultimately, the Death Star troopers owed their loyalty to the Imperial Navy and Tarkin himself as opposed to the stormtroopers who were loyal to Emperor Palpatine. Their advanced training meant that they served in command positions where standard troopers were found throughout the station. To cement their new positions, these troopers wore distinctive uniforms that became a symbol of their new power. These soldiers were often found in support roles, like guarding detention blocks, controlling the deflector shields, monitoring sensor arrays, handling hangar traffic control, and manning the superlaser on the Death Stars. 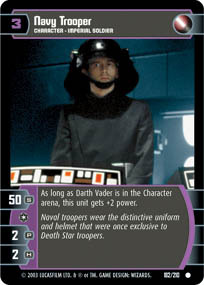 After its destruction, the uniform was spread to other Imperial Navy troopers throughout the fleet. Standard Death Star trooper uniform. They were distinguished by their swooping black helmets. Eventually, their uniform spread to other Imperial Navy trooper units, as well. These soldiers lacked a standard sidearm, with a good number of them being unarmed. The Death Star troopers guarding Detention Block AA-23 when Luke Skywalker, Han Solo, and Chewbacca rescued Princess Leia Organa in 0 BBY carried E-11 blaster rifles and DH-17 blaster pistols. The Death Star novel wrongly describes Death Star troopers as "stormtroopers in black uniforms." While the character Nova Stihl is at one point described as an Imperial Army trooper, he is later identified as one of the Death Star troopers in the Death Star conference room, and even later as one of the stormtroopers chasing Han Solo and Chewbacca. This seems to contradict previous EU, according to which stormtroopers are part of the Stormtrooper Corps while Death Star troopers are part of the Navy (and neither are part of the Army). However, the novel's Dramatis Personae indicates Stihl is part of the Imperial Marines, possibly suggesting Marines can cross-train to serve in any of these three military branches. The Kenner action figure release of the Death Star Trooper originally called this character "Death Squad Commander". Due to the negative real life connotations of that name, subsequent releases referred to it as "Star Destroyer Commander". The figure was given the Trooper's black helmet but had a gray uniform instead of black.